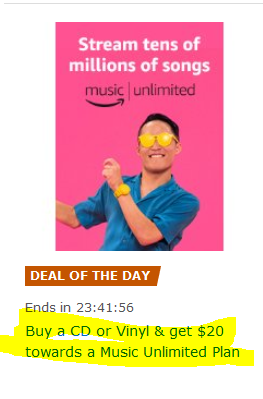 Also part of the Gold Box for Black Friday actual, if you purchase a Vinyl record or Music CD, you will receive a $20 service credit towards Amazon’s music subscription service (“Music Unlimited”). That’s essentially two months of service. If you are a new customer, you also get a free 1-month trial. The music CD or vinyl must be in new condition and must be “sold and shipped by Amazon.com” (in other words, Amazon actual must be the seller). Offer ends Saturday at 3am ET.